Like nearly every other woodworker on the planet, I built a “Dutch” tool chest a few years back; in fact, I built two. I enjoyed both projects, and it was a good chance to work on several different skills: dovetail joinery, dado joinery, mortise and tenon joinery, joinery, joinery, joinery. One of those chests I gave to my dad, the other I kept. For quite a while my chest was in my garage with most of my woodworking tools placed inside it. It sometimes sat on my bench, or under it, or under my feet. I bumped into it quite often, every now and again I would trip over it; I bent over countless times to get stuff out of it. Eventually, I smartened up, hung a cabinet and some tool racks on the walls near my work area, and put my Dutch tool chest in the attic. Here is the plain truth that nobody wants to hear: working out of that chests sucked. It wasn’t a size issue; the chest was easily large enough to hold the bulk of my woodworking tools. It is a simple matter of logistics, too much bending over, reaching, stretching, dropping, knuckle banging nonsense. I found the best way to work out of the chest was to put it on my workbench so that everything was at eye level. The problem there was it got in the way too much. Of course, I could put it back on the floor after I got everything out, but then all of that stuff was on the bench too. And who feels like picking up and putting down a 100 pound + tool chest four or five times? Not me. Okay, I’m complaining, so what solution am I offering? The same one that has been around forever: mount your tools on a wall rack and store them in a wall hung cabinet. Everything is at eye level, out of the way, easy to see and easy to reach. I’ve said this before and I’ll say it again: since I’ve mounted my tools on the wall I’ve become a more efficient woodworker. AND, my back feels a whole lot better. So here is my expert advice: If, for some reason, you travel a lot with your woodworking tools, make a tool chest for transportation. 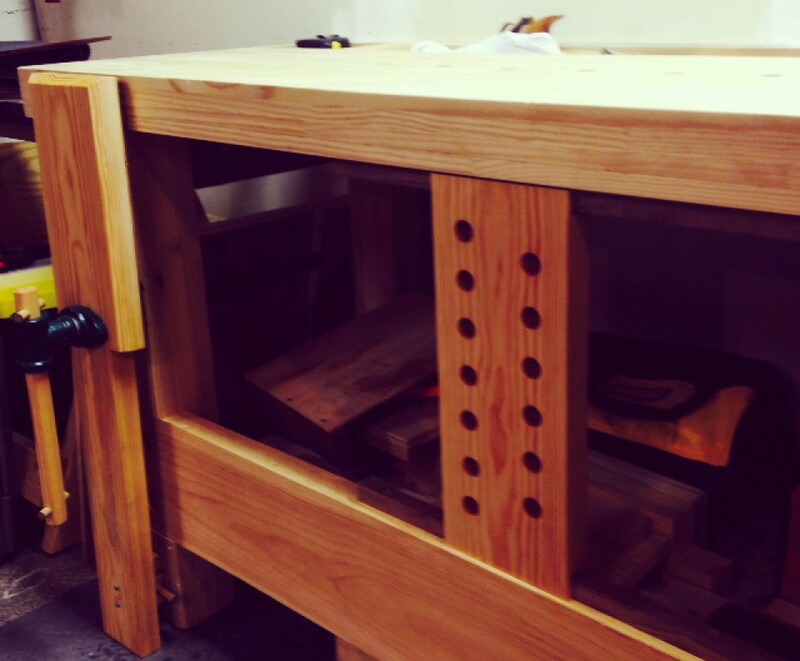 And if you are like the overwhelming majority of amateur woodworkers with tools that very rarely leave your work area, mount your stuff on the wall over your bench. Nothing bad is going to happen to your stuff if it’s out in the open. I live in a high humidity area and I’ve had very few rust issues. Keep your tools oiled (as you should be doing anyway) and they’ll be just fine. So why rehash a topic I know I’ve already covered? Well, a few weeks ago I was getting some things out of the attic and I saw my tool chest sitting on the floor. It still looked pretty good, and it will certainly still hold tools, so I brought it down the stairs, dusted it off, and sold it for a few bucks. I mentioned a few posts back that I had sold off some tools (mostly duplicates) and how I surprisingly had no sentimental attachment to any of them. But when I sold my Dutch tool chest I very nearly backed out of the deal. My second thoughts didn’t stem from the sell cost, I was just very reluctant to let go of something I had built myself. I’m hardly a great woodworker, but I put a lot of time and effort into my projects. For whatever it’s worth, and for all of it’s shortcomings, I thought that my tool chest looked great when I finished it. When I brought it down the attic stairs and briefly back into my garage, it seemed to “fit the scene”. But then I remembered why I put it into the attic in the first place, so I put sentimentality aside and did what I know was the right thing to do. And though I pride myself on being a person who makes the right decisions, the right decision in this instance wasn’t an easy one to make. September 7, 2017 12:00 pm / 2 Comments on Weather report. For the first time in a long, long time I was a “power tool woodworker” on Sunday afternoon. There was nothing momentous about this occasion, it just so happened, to happen. To set the scene, several years ago (I don’t remember exactly when), I purchased a weather instrument kit from Lee Valley because it was on sale and because they were offering free shipping. I’ve always enjoyed the appearance of vintage weather stations and I thought it would be a nice idea to make one. So like all new project ideas, I planned on starting that one ASAP, and the kit was promptly placed in a cabinet in my garage where it sat untouched for around 24 months give or take. In the meanwhile, I’ve managed to build up quite a stash of walnut, cherry, and ash, along with the prerequisite pine and poplar, and coincidentally I happened to see one of those weather stations at a museum recently, so I thought it would be a good idea to finally make my own version. The original plan was simple: a walnut slab cornered and chamfered with a basic finish applied. So I used broke out the table saw to cross-cut and rip the slab to finish size. The news is all good; the saw cut smoothly and there was no hint of bogging or binding, and this on a 1 inch thick x 13 inch wide slab of well-seasoned walnut. I then laid out the corners and cut the first one with a hand saw. Of course I had to clean up that cut with a block plane, and then it dawned on me to use the table saw to cut the other corners. Why not? What was the worst that could happen? Nothing happened, it took all of 2 minutes for the cuts to be made. I then needed to plane the board smooth, as it was a true in-the-rough board. I used a jack plane first just to get the bulk of the work done, and I then went to my Stanley #4. For whatever reason, it didn’t seem to be producing the results that I wanted, so I decided to turn to my coffin smoother, which is a tool that I painstakingly and lovingly restored myself with many hours of labor (thank you Graham Haydon). The plane performed above and beyond expectations and it should have, considering I spent hours on the sharpening alone. Lastly, I chamfered the edges with a block plane. Everything went so quickly I had myself a wacky idea: how about adding another panel, inset and raised above the walnut, in a lighter wood such as cherry. I had several nice pieces of cherry that would work, but rather than taking the risk of ruining them (in the sense that it wouldn’t look all that great) I decided to use a piece of scrap pine for a test run. So I went back to the table saw and quickly made the cuts. I then had to cut out the holes for the weather pieces, which required a 2 1/2 inch hole. My largest forstner bit is 2 1/8 inches, so I used a hole saw instead, and in the drill-press it worked just fine. All in all I like the look, though I do think it will look even better with a cherry panel instead of the scrap pine. When I removed the pine to apply a finish, it split a touch, not that it matters because it was only a temp solution, and I should have no trouble using it as a template for the cherry. The project came in at just about 2 hours, and I’m estimating that replacing the pine with cherry will probably be a 45 minute affair. I would have finished right then and there but the day was already getting long. Truthfully, I think maple would look even better but I don’t have a suitable maple board to use. Regardless, it was a fun little project, and I think it will look great in the area I have set aside for it. Not to get ahead of myself, but this is the first in hopefully a series of projects to create my own little “dream” office area, complete with old manuscripts, candle holders, writing desks, and quill pens. Yeah, I’m a history geek; I admit it.